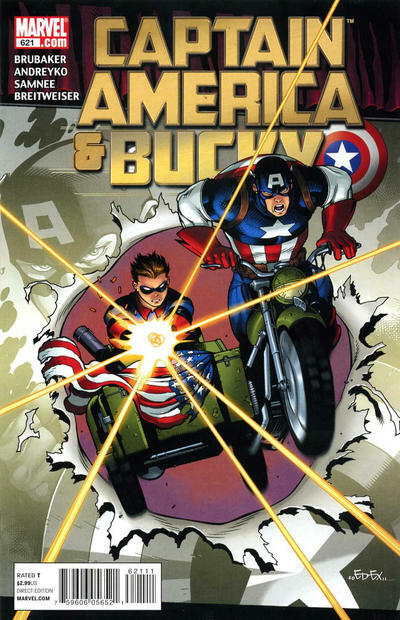 One of the storytelling issues with Civil War was that the split between Tony Stark and Steve Rogers seemed to happen too fast, and the lines seemed more drawn up by Marvel editorial than the story itself. Though X-Men Schism is telling a very similar story, the fracturing of the partnership between Wolverine and Cyclops, the fact that Jason Aaron is taking his time in building the tension between the pair is going to make that eventual split that much more believable. My only complaint is that the main threat, a group of hyper-intelligent children, is fairly slightly too similar to Eziekel Stane from Matt Fraction’s Invincible Iron Man run for my taste. 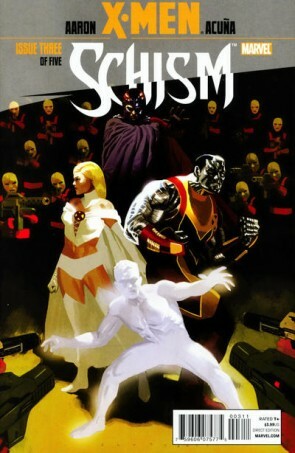 Schism is what I always wanted Civil War to be: an organic breaking point built on the shoulders of years of storytelling. This is the issue where Cyclops and Wolverine finally come to loggerheads and it’s an earned conflict. Even better – there’s no clear ‘right’ or ‘wrong’ like there was in Civil War. This issue also fleshes out the new Hellfire Club a bit more, and they are joyously creepy. Schism is Jason Aaron firing on all cylinders with an all-star art team and that is basically a must-read. First of all, everything with Idie in this issue crushed me. Crushed. Me. And then Generation Hope followed it up and destroyed me utterly. Oof. Whew. Ahem, OK. Now, as to the meat of the goings-on in the issue and especially the tension this builds between Scott and Logan: very well-played, Mr. Aaron. I’m totally buying into this schism. Logan concern for the innocence of those who still have it is a good contrast with his violent tendencies and rough edges and seems to fit well with what I’ve seen of Logan and his mentoring of all his girls. And Scott, whew. Like many seem to be, I’m not a huge Scott fan, but I don’t dislike him either; he’s just generally a bit too dull to inspire much interest. But, what’s been building with him as the leader of the mutants, trying to do what’s right and trying to protect his people, and how that’s clashing with other considerations like how his people themselves are impacted by his decisions. 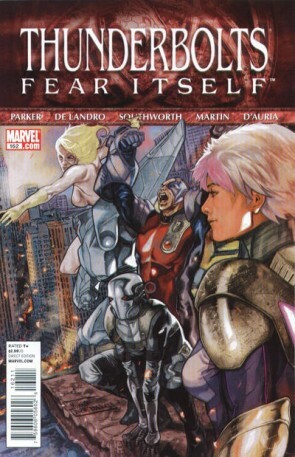 I just keep seeing that Fear Itself ad with Scott dressed like Magneto. It’s all bubbling up, and I’m absolutely hooked to find out just how it explodes. The previous issue of Invincible Iron Man, in which Tony Stark fell off the wagon and into an Asgardian dwarf’s quasi-magical workshop, was as strong an outing as this Fraction/Larroca book has seen in a while. Writing about an alcoholic’s relapse without falling into cliche is tricky, and moving the action to a magical/absurd context helped this audacious character beat feel fresh. Issue 507, unfortunately, is too more-of-the-same, and it turns out a little bit of carousing-with-dwarfs goes a long way. Otherwise, this is a serviceable event tie-in, Fraction’s character work is typically strong, and the Pepper Potts/Sasha Hammer mecha fight is good fun. Still, the issue doesn’t advance the story much, and the resolutely boring artwork of penciller Larroca and colorist Frank D’Armata does Fraction’s script no favors. 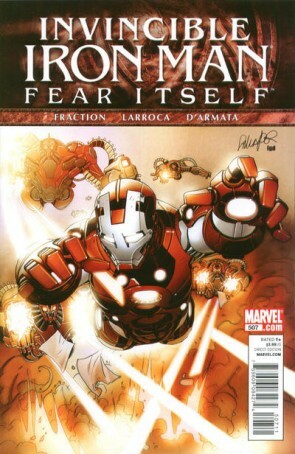 Back from Paris and now in Asgard designing weapons, as seen in Fear Itself, Tony Stark shares the focus of this issue with Pepper Potts who has headed back into the city that Tony has fled, meeting up with Sasha Hammer and a team of Hammer Industries armored soldiers. At this point I’m starting to get Fear Itself fatigue, and it would have been nice to see the characters in some other context than moving at the edges of the big event. I consistently love Iron Man, and think that the character work being done with Tony in Asgard is compelling, but the book feels uneven with its switching back and forth between Asgard and Earth. And there are more dwarves, too. All told, though, your mileage on this book is going to be directly related to your attitude on the loss of Tony’s sobriety. As a result, this is going to be a divisive one. 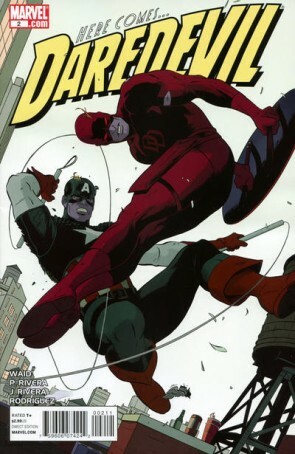 The worst I can say about this one-shot, an installment in DC’s series paying tribute to various eras and creative teams for their most popular characters? It’s too expensive. Chop out the pointless reprint and charge me $2.99, and it’s about the perfect superhero comic book. Don’t most of the people who will buy this already have the reprint in their longboxes anyway? 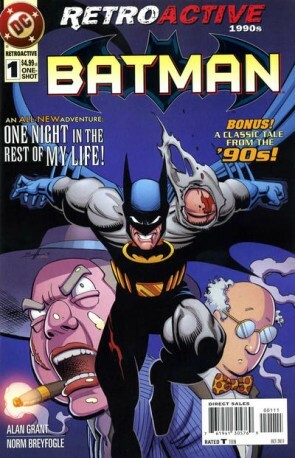 Story-wise, if you’re like me and have fond memories of the Alan Grant/Norm Breyfogle run on Batman from the early nineties, you will get a big kick out of this story. It reunites the creative team with one of their best creations, the villainous Ventriloquist and his mystical dummy, Scarface. It stirs in a bit of the fantastic with a dead mobster zombie resurrected by radioactive waste, and Grant probably approaches the tenuous philosophical underpinning of his story from too great a height. Any Batman comic book that features the caption “What is life?” on its second page might be gettin’ a bit above its raisin’. 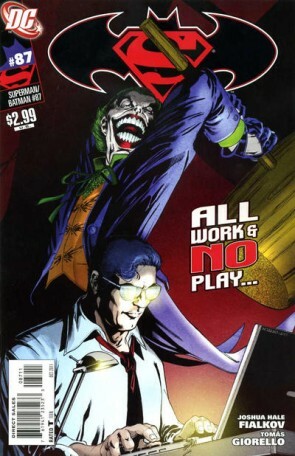 But as a kid who cut his comics teeth on these very Grant/Breyfogle books, it was a treat to return to that era. Let’s see more, DC. While the cast of the book has gotten too big to keep track of, it’s still an incredibly fun read. The core characters are delightful, particularly the rather weird relationship between Moonstone and Man Thing. The art, and the influx of new characters that have joined the book in recent issues make it a bit hard to follow who beyond the original cast of Jeff Parker’s run, is doing what. There’s a conspiracy going on, but I’m not quite sure whose involved or what they’re hoping to achieve. Still there’s enough awesomeness going on to keep me interested including a Giant Size Man-Thing. This issue is all about Jeff Parker playing the long game. He’s taking plots from various points in his run and smashing them into one another in the most inconvenient way possible. And it’s consistently fun, which is a feat. And as a bonus, we get a splash-page-sized joke that Parker has to have been sitting on for the better part of a year. I’m not sure what it says about me that Thunderbolts and Secret Six are two of my favorite comics from Marvel and DC — but I don’t think I’m alone in my love of these anti-hero books. I don’t know, maybe now that I’m older, there’s something about actual bad guys being bad (or maybe even trying to be good) as opposed to good guys being bad, since, let’s face it, how the Thunderbolts act and how a lot of “heroes” act in superhero books isn’t always that different. With youthful rebelliousness behind me, I may be more drawn to stories about evil striving to be good than about good constantly faltering into evil. Hmm. Well, more specific to this issue, while the reptile critter storyline isn’t doing much for me, the machinations of the various Thunderbolts always makes for a good read and the whole subplot with the Man-Thing and Satanna has me intrigued.